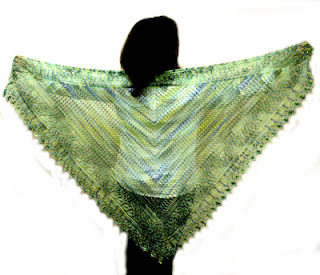 The beautiful Hydrangea shawl pattern has arrived. It takes one skein of Ivy Brambles Romantica in, of course, Hydrangea. Although it would look beautiful in any of the variagated colors of Romantica. The picture below shows the edge detail, although it looks even better in person. 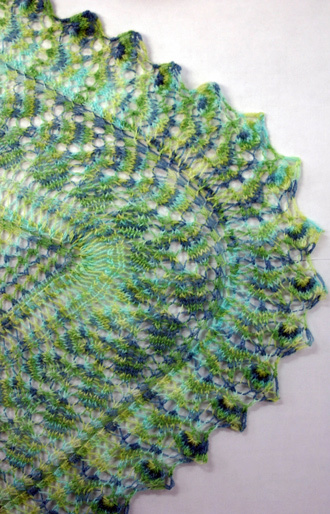 We are very excited with this new shawl as it is both easy to knit (for a lace project anyway) and quite stunning. If you haven't tried Romantica on a lace project before I'll tell you something about it. It comes in over 40 colors and growing, in both variagated and semi-solid hand dyed colors. It is a true lace weight at 1000 yards to each 4 oz hank and is made with very fine quality, super soft, superwash Merino wool. This isn't sock yarn turned into lace weight, the twist and quality of fiber was specifically selected for lace work and it works fabulously. Click here for our full range of colors. Copyright (c) CYDJ Designs Inc. 2011. Picture Window theme. Powered by Blogger.